REELRADIO - The Rob Grayson Collection! 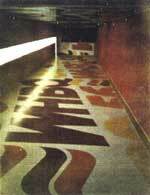 The main hallway at WHBQ - they didn't want you to forget where you were. Rob Grayson says, "I was the typical child-prodigy disc jockey. 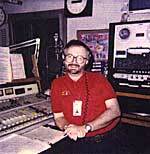 My first after school job was an airshift at an easy listening FM in Greenville, Mississippi, at age 14. My main influences were my brother Walt, who preceded me in radio; WLS Musicradio, especially Bill Bailey and John Landecker, and top 40 stations from the closest "big" markets like Jackson, Mississippi, (WJDX, WRBC) and Memphis (WHBQ and WMPS). During my senior year in high school, I got a job doing weekends at WJDX, which meant a 120 mile commute one way, but hey, it was the big time! A year and a half later, George Klein was kind enough to give me a break at WHBQ, and I was able to have a front row seat to witness AM top 40's last stand. Rick Dees came aboard and took the Q for quite a ratings ride. As a matter of fact, I would say that Rick single-handedly staved off the FM onslaught until his departure for Los Angeles. I did middays as a part of the final Top 40 crew at Plough's flagship station, WMPS, and moved on to do Superstars AOR with one of the greatest families I ever worked with at WZXR (now WEGR). My duties have always involved production, and I made a segue into a permanent "production shift" in 1988, as a recording engineer/producer at Wilkerson Sound Studios in Memphis (founded by former WHBQ jock and production whiz, the late Skip Wilkerson). From August 2004 until October, 2005, I did the morning show on Sirius Satellite Radio, Channel 13  Elvis Radio. It was an all-Elvis station broadcasting from studios at Graceland here in Memphis. I spend the rest of my time keeping up with my wife and daughter, and playing bass in my church's Praise Band. But, enough about me. . ."
The Repository thanks Rob for this Collection!
. . . Hits with a beat get a rapid repeat on the Boss. . .
Class president of Humes High in Elvis Presley's graduating class, and the best man at Elvis' wedding, George Klein was an original member of the "Memphis Mafia". At WHBQ, George was a high-profile personality and Program Director.
. . . Ladies and Gentlemen, the Beat Goes On. . .
And here's George Klein again, 3 years later, demonstrating the classic RKO-Drake influence.
. . . I'm gonna take away your Mitch Miller button . . .
Quite active nowadays as a national voice-over talent, Jack Parnell was a Boss Jock at WHBQ from the Wink Martindale days through the Drake era, including stints as Program Director and Drive jock. He mentions a "ham fest" he was to attend; you can still catch his mellifluous tones at K4BSI. Parnell's son, Chris Parnell, is a cast member of Saturday Night Live.
. . . you'll always find Icey Bear on the cup, or in the cooler in the back getting sauced . . .
WRBC, Jackson, Mississippi, was a stepping-stone to the majors for a number of folks, including Gerry Peterson-Cagle (KCBQ, KFRC), Dr. Grady Brock of WCFL, (here referred to as Super Shannon), and Bob Pittman, who later programmed MTV. In this "before we he was quite so famous" aircheck, we hear Harry Nelson (WRKO, KFRC, KSLQ) doing afternoons.
. . . Am I still President? . . . In the late 60's to early 70's, WJDX (620) Jackson, Mississippi made the transition from old line MOR to Adult Contemporary, and several programming luminaries sat behind the mikes in the old WLBT-TV location downtown, or the state-of-the-art studios in North Jackson they moved into circa 1973. Most of the staff you hear on this composite actually left the station in a mass walk-out following the dismissal of programmer Bill Tanner due to a misunderstanding with management. Tanner, of course, went on to bigger and better things as National PD for Heftel (Y-100, 13Q, etc.) at their apex in the '70's, and the others made their mark on the industry in various locations and positions. WJDX had the Johnny Mann acapellas, and applied much of the Top 40 stylings with the AC music mix. Nowadays, though AM 620 is sports and talk, the musically formatted WJDX carries on as an FM station.
. . . if that doesn't work, hold his upper lip between your toes . . .
Plough Broadcasting's WMPS was known for its emphasis on morning personalities, from the Flying Dutchman to Crazy Bob McClain to Rick Dees. Rick came to Memphis from WSGN, Birmingham, following McClain as WMPS morning man. Rick combined his outrageous spontaneity with a determination to "take it to the streets" promotionally, and rode the numbers staight to the top. It was while at WMPS that Rick recorded Disco Duck, and legend has it that this "conflict of interest" was one of the dynamics which led to his dismissal at WMPS.
. . . flip side is cow chips keep fallin' on my head . . . This WHBQ Composite from late Fall, 1976 features Rick Dees and Terrence McKeever, who do a bit about Jerry Lee Lewis (allegedly, you know) waving a pistol at the gates of Graceland. Dees pulled no punches, making light of The King, in The King's home town, while The King was still alive. Dr. John was program director John Long. Bob Landree came from San Diego to do afternoons. Stu Robb moved to middays, and Dickie Doo Edwards rocked at night. Sheila still did the late nights, a position I would move into after she left for Houston. Walt Jackson did overnights. I was there at the time doing 20 hours on the air on weekends and swing shifts. I recall this composite was made "on the quick", and I was out of town for Thanksgiving. I missed being immortalized, but I do make a cameo as Ronald Retiree in the Landree segment.
. . . we regret to inform you that Morning Has Broken; therefore we have substituted afternoon . . . I am not a great air talent, but was more of the weekend/all night/production guy, doing the filler shifts. My composite is mostly like a postcard that says, "This was a nice place to visit. I had a lovely time, wish you were here." These are airchecks from my formative years, the first three while I was still a teenager. The WJDX/Jackson tape was the one I sent for an audition to WHBQ/Memphis. The 13-Q/Pittsburgh tape was my last shift before fleeing south again. The first WHBQ aircheck is from a Fall 1976 composite, and the second WHBQ 'check was my 20th birthday. The FM100/Memphis tape was from a couple of years ago, once again doing weekends. By the way, the promo on the end was for one of the incarnations of Rock 103, and features the voice of Joe Kelly from Chicago.
. . . the dream is over . . . Following the tragic assassination of John Lennon (Monday, December 8, 1980), my station (at that time, WZXR, Memphis) aired a memorial tribute. It aired on the weekend after the tragedy, and included a ten minute period of silence, followed by this piece. It is a montage of all The Beatles songs, edited from A to Z. The version here has been updated to include material from the Anthology series. Ironically, I was working on the piece even before the Lennon tragedy. I was moved to complete it in time for the tribute. My inspiration dates back to the WLS Time Capsule pieces, which aired every New Year's at midnight. The concept of doing a montage stuck with me, and I have applied it to a number of situations. This exhibit first appeared at REELRADIO on December 3, 2000. In 2006, I created a new digital remix (Version #9), with all music sourced from CDs. REELRADIO debuted the remix on April 28. 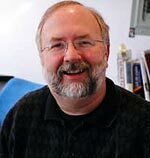 The Rob Grayson Collection has been part of REELRADIO since July 5, 1998!